I write to register my opposition to the proposed name change. 2. Bugsby’s is a locationally specific name, linked to a past usage of a specific part of the river as an anchorage, whereas the suggested replacement is generic with no real connection to this particular stretch of river. 3. Your suggestion about the historical basis of the name is contested by local historians – and the name Bugsby’s Hole indicates that this was an anchorage from the 18th century or earlier. I have yet to see evidence that Bugsby was a person, let alone that he was a market gardener. 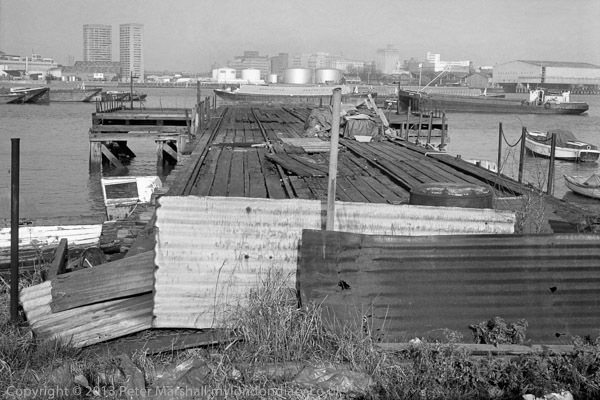 – see the article by Mary Mills at http://onthethames.net/2014/02/14/platform-defence-bugsbys-reach/ in ‘On the Thames’. You appear to be attempting to mislead respondents in your statement on this consultation. 4. I think the current name has much more character than the proposed replacement which seems bland in comparison. 6. There are other stretches of the Thames which would seem to me to have a greater claim to the name Waterman’s Reach, and I think if any stretch is to bear that name it should be on the course of the ‘Doggett’s Coat and Badge’ and most obviously close to Watermen’s Hall. There isn’t even a Waterman’s Pub on this stretch! Brentford could also make a good case with a Watermans Arts Centre and a pub. 7. Surely it should in any case be Watermen’s Reach and not Waterman’s Reach – which I’m afraid makes me think of fountain pens not watermen. 8. There appears to be no particular reason why Bugsby’s Reach should have been selected for oblivion. 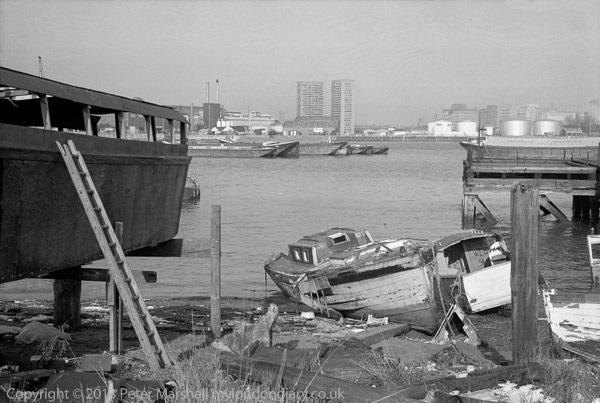 There are other reaches with names with far less character that could have been selected, for example those that are simply geographic in nature – such as Woolwich Reach. I’m not against change, but want changes that give the river greater character not reduce it. 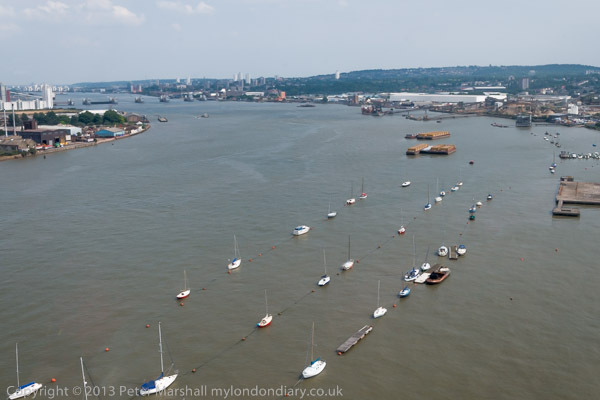 The Port of London Authority (PLA) is currently consulting over its intention to change one of the old established names for the reaches on the River Thames, Bugsby’s Reach, which extends from the tip of the Greenwich Peninsula at the Millennium Dome (O2) to Charlton. I’ve sent my comments – but if you have an opinion why not tell the PLA too. You can read more about the proposed name change for this stretch of rive in Bugsby’s holed? 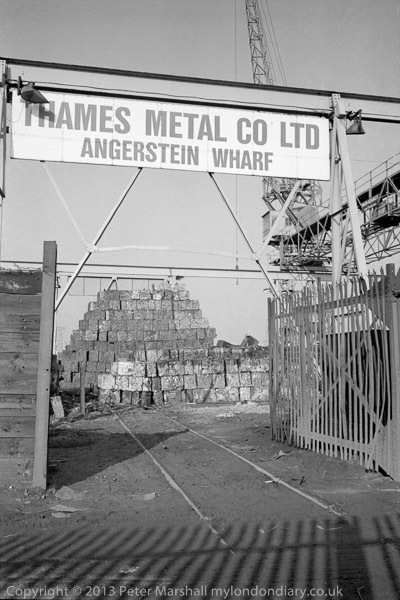 Why a bit of Greenwich’s history is under threat on the 853 blog. Dr Mills is also one of our leading industrial archaeologists and almost certainly has researched more about the history of the area than anyone else. If the PLA had done any local consultation about Bugsby’s Reach they would certainly have approached her. You can read her views on the change here. I can only speculate (as I often do!) why the PLA has it in for poor Bugsby’s rather than choosing any other named stretch of the river to obliterate. Could it be because it is a name that sits uncomfortably with the property developers who want to cover every riverside plot with unsightly luxury flats to sell to overseas speculators? It has an unattractive sound – bugs, bogs, bogeys, bogles, bugbears, buggers, boggarts… none very pleasant, though perhaps related to the history of the area, which certainly was boggy and full of bugs (the land is Greenwich Marshes) and it was also a place where the bodies of executed criminals were formerly hung in chains, so doubtless a haunting ground for malevolent spirits. 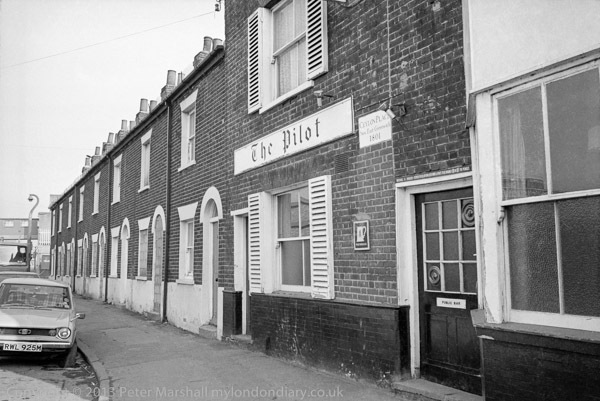 The Pilot, built (according to Mary Mills) in 1804 on Ceylon Place, New East Greenwich is still there, though the interior was apparently refurbished last year, and it is now a Fullers pub. It and the adjoining cottages were built on the causeway leading to Bugsby’s Hole which was given approval in 1801, the date recorded on the stone at the left of the sign. It’s name is not directly related to the river, but to Prime Minister William Pitt, described by George Canning as ‘The pilot who weathered the storm’ for his negotiation of the 1802 Treaty of Amiens which ceded Ceylon to Britain. It is no longer a Whitbread pub – and Whitbreads are no longer brewers. This entry was posted on Tuesday, March 11th, 2014 at 09:43 am and is filed under My Own Work, Political Issues. You can follow any responses to this entry through the RSS 2.0 feed. You can leave a response, or trackback from your own site.